We all know that when the weather gets colder and the days get shorter it’s harder to stay active and motivated. Lying in bed all day seems so tempting, but you don’t want to lose the fitness you have worked so hard for! Cycling is one of the few sports that you really can do all year-round, so here are a few helpful hints to keep you cycling through the cooler months. 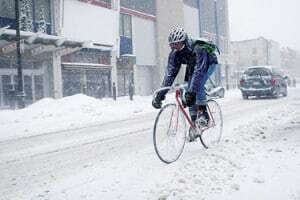 1) Dress for the weather – with the latest cycling clothing it is perfectly possible to insulate and protect yourself from the elements so you can cycle quite happily through the winter. And, when you buy new clothing, you’ll benefit from the motivation to try it out. 2) Preparation is key – don’t leave everything until the morning. Get all your clothing, kit and bike prepared the evening before, so when you wake up everything is laid out and ready to go. 3) Get some lights – don’t let the dark mornings and evenings put you off. With a set of modern high powered lights, you can get outside before most people are even out of bed. 4) Enter an event – set your sights on a future event. You will have the incentive you’ll need to summon up the motivation to ride because you’ll want to stay fit and improve your fitness so that you arrive at the starting line in the best possible shape. 5) Have a winter plan – having a goal to give you a sense of purpose can be a great way to get you outdoors on the bike when the weather conditions might be less than favourable. It can be anything from deciding to commute to work twice a week, to setting a weekly or monthly distance or duration goal. 6) Cycle commuting – if you don’t already cycle commute, then winter is a great time to start. Not only is it a great way to keep your fitness ticking over, but it will save you money and is exhilarating compared to being stuck in a train, bus or car. 7) Explore new routes – avoid riding the same routes all the time. Instead, plot new routes to explore roads around your local area and to discover new roads and new ways of linking up existing roads. 8) Meet a friend for a ride – cycling on your own is hugely rewarding, but sometimes when the weather is bad it can be really encouraging to plan a ride with a friend. You’ll have the incentive of not wanting to let them down and having to meet them at a certain time to force you out the door. Riding with a friend in bad weather can be great for moral as you’re both in it together. It can be good from a safety point of view too. 9) Ride with a local club – these clubs are not only a good way of making new friends, but having a regular meeting time gives you the boost of motivation you need to get on your bike. Riding in a large group is good for spirits when the weather is bad, and you can also usually ride a bit faster and seek shelter from the wind by taking it in turns at the front of the group. Time flies by compared to riding solo. 10) Get a coach – If you’re a competitive sort and maybe fancy doing some racing next season, then enlisting the services of a professional coach can be a really good idea. It might seem an elaborate expense and only for the professionals, but a coach can help cyclists of all levels and abilities. 11) It’s only weather – just remember, it’s only weather so don’t let it put you off riding in it. We’re fortunate here that the winter is mostly mild and is well suited to year-round cycling. 12) Just get outside – don’t think too much about how bad you think it might be and instead, don’t think about it at all. Just get dressed, get out the door and get riding. Most of the time it’s never as bad as you think it will be. And the reward for having gotten out will be immeasurable. So there you are, no excuses now! Go into winter with a positive attitude and come out of it feeling fit and healthy and well prepared for the following Summer months.